Two percent of all children and almost seven percent of all African American children have a parent in prison. This chapter discusses the adverse effects of parental incarceration on children and the types of stressors children experience because of their parent’s arrest and imprisonment. The chapter concludes by identifying some protective factors that may promote resilience in children with an imprisoned parent. The proportion of children affected by parental incarceration has risen substantially in recent years. In 1986, 10 in every 1,000 children had a parent in prison or jail; by 1997, that rate had doubled to 20 per 1,000, or 2.0% of all American children (Eddy & Reid, 2003; Johnson, 2006). The number of children with an incarcerated father increased 77% from 1991 to 2004 (Glaze & Maruschak, 2008). In 1999, 6.7% of African American children and 2.4% of Latino children had an incarcerated parent, compared to 0.9% of white children. Compared to white children, African American children were seven and a half times more likely to experience the incarceration of a parent (Glaze & Maruschak, 2008). As noted earlier, an estimated 2,473,300 children in the United States have a father incarcerated in prison or jail, and unpublished estimates by Mumola (2006) indicate that 7,476,500 children have a parent who is incarcerated or under correctional supervision. An empirical understanding of the effect of paternal incarceration on children is beginning to emerge, particularly in the wake of several major longitudinal analyses of child outcomes in cohorts that included children of incarcerated parents (Murray & Farrington, 2005; Phillips et al., 2006; Kinner et al., 2007; Murray et al., 2007). Several serious limitations persist in the literature. Studies that aim to measure the effect of parental incarceration often do not distinguish between the experiences of children with incarcerated mothers and those with incarcerated fathers, even though researchers acknowledge that these experiences are likely quite different (Parke & Clarke-Stewart, 2003). 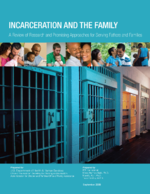 More research is needed to distinguish the unique stressors and outcomes related to having a mother versus father incarcerated as well as the developmental implications of the timing of their imprisonment. Many studies of the children of prisoners have relied on data collected via surveys of the incarcerated parents (Johnston, 1995). Therefore, data on psychosocial outcomes in this population are based on secondhand reports rather than on direct administration of assessment tools to children. Future research should incorporate direct child assessments and observational studies of parent-child interaction. Most studies of the effects of parental incarceration have employed cross-sectional rather than longitudinal designs, have examined small and nonrepresentative samples, and rarely have been grounded in principles of child developmental or other theoretical perspectives (Parke & Clarke-Stewart, 2003). Of utmost importance is the need to conduct longitudinal, prospective studies that follow children through the various stages of their parents’ involvement with the criminal justice system (arrest, sentencing, imprisonment, release) to assess changes in well-being over time and identify malleable risk and protective factors for future intervention. The limitations addressed here make it difficult to draw firm conclusions regarding differential outcomes for these children and even more challenging to determine causal pathways (Hagan & Dinovitzer, 1999).